While I was organizing my office recently, i stumbled across an important modern Internet industry relic -- the AT&T PocketNet Phone. There is a great story behind this device and my explorations with it, and it's fun to think back to this just as the mass market is finally embracing the mobile Web through the iPhone, Android and the like. 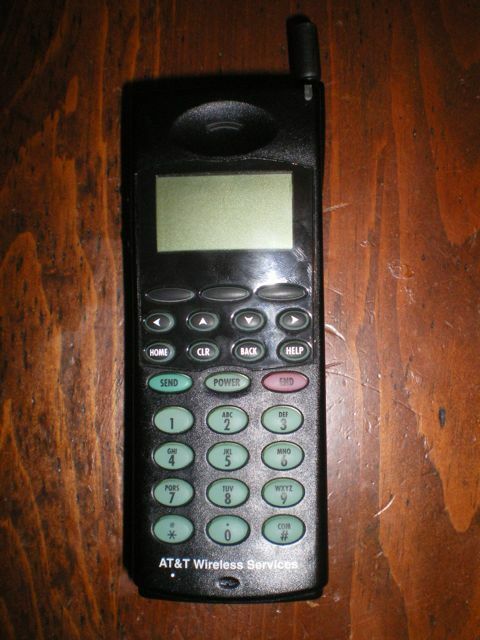 First, here are a picture of the PocketNet phone. This phone is actually THE FIRST web-enabled mobile phone in the world. It is actually a prototype phone, it was never shipped to the general market. It was designed in collaboration with AT&T and Unwired Planet, who invented the mobile web with a simple text markup language and browser for low-end mobile IP devices. UP's Handheld Device Markup Language (HDML) later became Wireless Application Protocol (WAP), which is now ubiquitous in mobile devices around the world. Back in the fall of 1996, we were busy getting ready to ship ColdFusion 2.0. I was really passionate about the idea that the Internet as an application platform would mean that you could write applications for any device that spoke Internet formats and protocols. I was convinced that the proliferation of IP-connected devices was soon among us and wanted to showcase how new server-based runtime platforms could support this vision. I stumbled across Unwired Planet through some news article, went and met the founders, we hit it off, and soon thereafter ColdFusion was the first commercial web application server to natively support HDML application authoring and delivery. You can see our announcement from back then here. In addition to creating some sample apps that would showcase using CF and HDML doing database app stuff, I wanted to explore the 'converged device' vision a little further, so in a bit of uber-geekdom I created a home automation application application that tied together a mobile web app controllable via the PocketNet device, a ColdFusion server app in my home, connected to an X-10 controller system that could automate devices in my home over the electrical network in my house. I convinced a developer in Florida to build an X10 'custom tag' extension for ColdFusion (you can still find the extension on the Adobe site), picked up some X10 gear at RadioShack, and connected it to lighting and my coffee maker. From my mobile phone, i was able to pull up from anywhere in the world whether the lights were on or off and switch them from my phone. For shits and giggles, i also connected it to the coffee maker just so that I could say that I had brewed coffee from my phone from across town. It's 13 years later now, and the landscape of the mobile web and the converged Internet is really truly here, but I still feel like we're just getting started in many respects. It's been humbling and awe inspiring to see the incredibly range of innovation coming out of new open mobile platforms such as the iPhone. Just for comparisons sake, here a snapshot of the latest mobile video browser build for the iPhone using the Brightcove Media APIs.